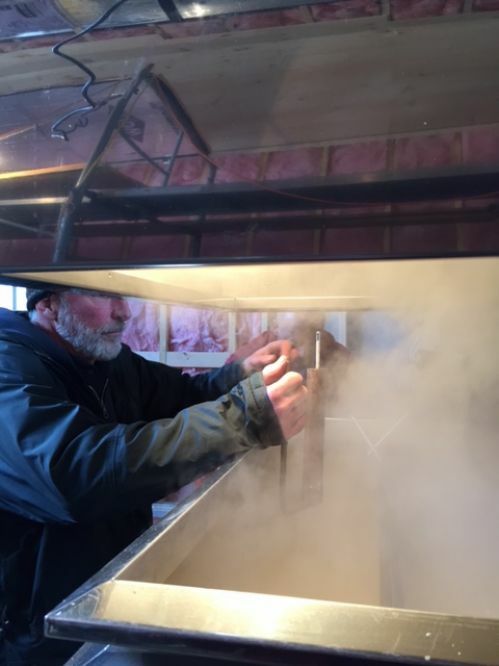 Maple sap from our sugarbush ranges from 2.5% sugar at the peak of the season down to 1% at the end but we usually quit when it gets bellow 1.3%. The sap gets hauled from the collection tank at the sugarbush by a truck and is pumped into a storage tank at the sugarhouse. From there the sap gets pumped through a reverse-osmosis system, where all of the sugar is concentrated into a much smaller volume of sap by pushing the water through a membrane that the sugar molecules can't fit through. The concentrate flows continuously into the evaporator through a float valve that keeps the level the same despite the steam that is evaporating away and the syrup that's being drawn off. As the sap flows through the baffles in the evaporator, the sugar concentration increases and as it does the boiling temperature and the density also increase. Finished syrup boils somewhere around 219 degrees (depending on elevation and atmospheric pressure). The hydrometer I'm using measures density and is not effected by such things.